University Project by Andrea Müller & Jürgen Röhm, 2010. TouchPhysics is a prototype of an educational software for learning physics on a multitouch tabletop. It’s supposed to make learning fun by being playful and intuitive. Students are encouraged to explore how physical properties like weight etc. affect the behavior and motion of objects. For demonstration purposes, we used the classic example of the inclined plane. The application design has the look and feel of a typical desk enhanced by cutting-edge technology which makes for a great user experience. 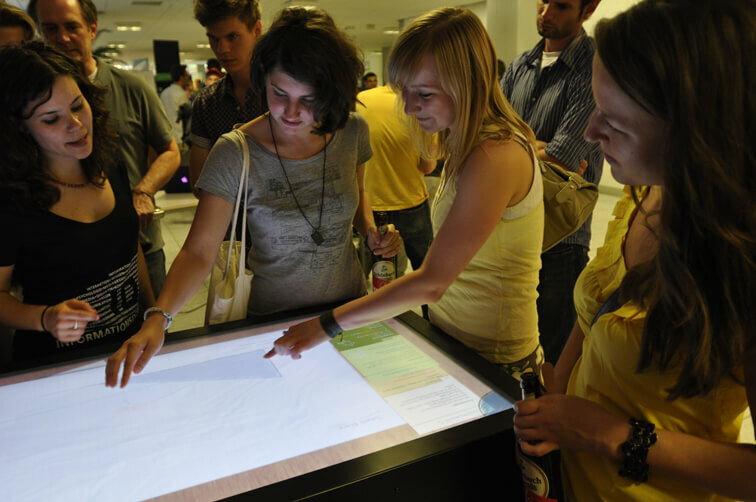 We developed TouchPhysics for a 47″ multitouch table from Evoluce. Our goal was to show the possibilities of multitouch in the educational space. It did large parts of the implementation using AS3, GestureWorks and the $1 Gesture Recognizer.